For the next major update, the skill tree is going to be reworked significantly. Our motivations with this were to increase the amount of build diversity, encourage clever playstyles rather than mindless ones picking the same cookie cutter skills, and make players put a bit thought. We also want to encourage remorting and experimentation. You will receive a full refund of your skills when this update rolls out. I’m considering also enabling the skill refund system as the skill tree is going to get pretty large. This would allow you to reallocate skills every once a week or so. 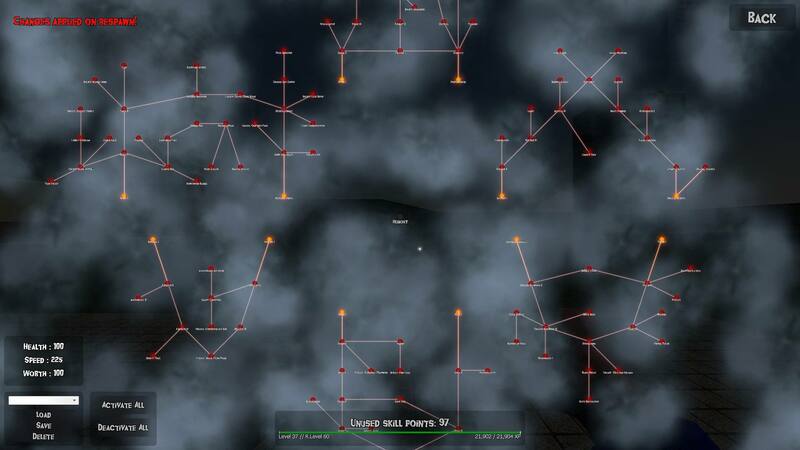 The skill tree is going to be separated into several, smaller subtrees with their own starting points. We opted to give each tree 2 starting points for a total of 12 unique locations to start. This is a old work in progress screenshot, but it looks pretty much like that in terms of layout. Some of the trees are less fleshed out than others, which is what we intend to rectify. Specifically the speed and medical/support trees are pretty barren. We are looking for suggestions for these. Remember the downside must be relevant to the upside if it isn’t an unlock. Also visual changes are probably in order, maybe to signify starting points a little better and denote which tree is which potentially. But perhaps the positioning is good enough. We might do consumables as part of this update which occupy the medical/support tree (in terms of flavour) as short term buffs which apply and can be used from the inventory. This would help flesh out that particular tree, but medical skills would be always welcome in that regard. Visually I’d like to see an unique icon for every upgrade and separate each tree with a color. Maybe a label for each tree which tells me what it is before I zoom in or hover above a node. “Support”, “Attack”, “Defense” something something I dunno. For every skill, an icon? When there’s 120+ skills? Separating the tree with colors seems reasonable enough though, as long as I can key in if a skill is unlocked/locked/activated/unlockable within that. gonna have a map to fight an ancient zombie in a labyrinth for unique skillpoints?? Love to do something interesting like that with an advanced tree in some regard behind a remort/difficult map wall, but I’m not sure if that’s silly either. Still need suggestions for skills themselves on this tree. Looking for something novel but concise. Downsides relating to the upsides as always.